The body of Nyasha Joseph being pulled from the sea. (photo credit: cnc3). Inset is the deceased policewoman. PORT OF SPAIN – Following the discovery of the decomposing body of a 22-year-old policewoman who went missing last week, law enforcement officials have vowed to bring the killer to swift justice and Prime Minister Dr Keith Rowley has made it clear his government will be taking whatever steps are necessary to resume hangings. 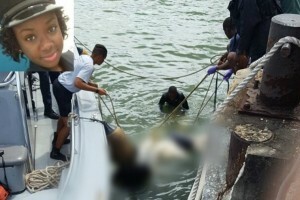 Joseph’s body was found by a fisherman in the Gulf of Paria near Port of Spain on Wednesday, six days after she disappeared. It had been disposed of in a crocus bag, but it became snagged in the fisherman’s net and he brought it to the surface. He will receive a $25,000 reward that had been offered by Crime Stoppers for information about Joseph’s whereabouts. At least three people, including a woman who is said to have had an argument with Police Constable Joseph days before she disappeared, have been detained by police in connection with the murder. One of the men is the 36-year-old father of the female suspect’s child. He was reportedly romantically linked to the woman, Joseph, and three other women. The second man, 24, surrendered to police hours after Joseph’s body was found. He is being questioned in connection with transporting the body out to sea. The cause of Joseph’s death has not been ascertained. An autopsy was inconclusive due to the state of decomposition, police said. He stressed that those responsible would be brought to justice in the shortest possible time. Prime Minister Dr Keith Rowley said he was pained by the tragedy and, noting that the country was traumatized by the spate of murders, said his government would seek to revive the death penalty. “I am a firm believer in capital punishment and it is not as a result of any deterrent, it is the punishment for the crime,” he said. The last execution in Trinidad and Tobago was on July 28, 1999 when Anthony Briggs was hanged for murdering taxi driver Siewdath Ramkissoon during a robbery seven years earlier. Joseph’s mother Paula Guy has a broken heart, but she has decided to surrender the pain of losing her daughter to God. That is the only way she will cope with unanswered questions about the killing. She admitted that she first thought of committing murder herself, as she wanted to take the life of the person(s) who left an irreplaceable void in her family. “I wanted to kill him, break he neck, shoot him, all kinda thing I wanted to do. But as the days go by and I find my child body, I kinda let it go,” she told the Trinidad Guardian newspaper.